We’d love your help. Let us know what’s wrong with this preview of The Portal Series by Charlay Marie. Jen Kallis never forgot the night her father vanished into a strange, white light from inside her closet. Even though no one believed her, Jen knew what she’d seen and refused to accept that her dad had abandoned her and mom. Ten years later, Jen, now 17, remains haunted by his disappearance when, without warning, her closet door bursts open and reveals a bright white ligh Jen Kallis never forgot the night her father vanished into a strange, white light from inside her closet. Even though no one believed her, Jen knew what she’d seen and refused to accept that her dad had abandoned her and mom. Ten years later, Jen, now 17, remains haunted by his disappearance when, without warning, her closet door bursts open and reveals a bright white light. Stepping through the light, she time travels to the year 2222 to a world far different from her own. Everything in Blue City is strange, with buildings that soar too high in the sky, hover cars that zoom on transparent blue streets, and robots that look just like humans. To ask other readers questions about The Portal Series, please sign up. Charlay Marie has done a phenomenal job with this scifi-mystery-romance novel, and she has left me craving more. She deals with real topics such as depression and abuse, but at the same time, keeps it whimsical and action-packed. From the minute I finished it I've been theorizing about what's going to happen next. But to understand that, we have to go to the beginning. We are first introduced to our first main character, Jen, at the very start of the story. She is a strong, biracial female who will not take any sass. I absolutely love Jen, and she was my favorite character throughout the whole book. The fact she was a biracial female character was extremely important to me because I feel like YA books have zero diversity in their characters, and it's something refreshing and new. (It's infuriating to me that characters of color are seen as "refreshing" because it shouldn't be an issue in the first place. What's wrong with having a character who is biracial, black, latina, Asian, or Native American? But back to the book). Jen seemed to jump to many a conclusion without thinking a situation through, but I feel like this left her for more room of character development. In the later books I would like to see her become more aware of this. I relate to Jen a lot, and actually decided this based on the first thing she said about her curly hair. I believe she said something along the lines of it being monstrous and out of control, and how everyone wants it and says it's beautiful. That's literally my life on a daily basis. The story quickly picks up action, and by the second chapter, we are already wrapped in the mystery of the disappearance of Jen's father, who she swears saw disappear into her closet one day. Her mother dove into a deep depression, convinced her husband had left them, forcing Jen to grow up on her own. I did think the world building was a bit descriptive for my taste, but in the end I was grateful because the Blue City is a very complex world and requires immense detail. I absolutely loved the fact that the book was mystery, because usually the scifi books I read are dystopian, and the characters aren't trying to solve a case. Additionally, the fact that it was evident Jen needed help from Asher and Lark made the story even more lovable, because they worked very well as a team, even though they were very different from one another. What a perfect Segway! Why don't we discuss Asher and Lark? Oh, Asher. Where do I begin? Basically from the moment he was described I was in love with him. I couldn't take it when he was being really dumb in his POV with Rouge in the house. I was like, "are you crazy???? Are you KIDDING ME????" I was ridiculously mad. He is such a sweet guy and I still can't believe he endured so much as a child. I wish he would have been slightly nicer to Jen at the start. Of course, we know at the end of the book why he had such a guard up, and Jen wasn't taking crap from him, so it worked out fine. Lark was so adorable I couldn't stand it!!! He was like the little brother who was really smart and just wants to help everyone. I just knew I would love him. He was so eager to win Jen's approval at the beginning, and toward the middle/end he became more of a best friend rather a "servant". I started to really like this book within the first 10 pages! I liked how right off the bat, the reader is introduced to the main plot point where Jen’s father falls into a portal in her closet, and how the rest of the story builds from there. I also loved a few other things that I love seeing in books. 1. Jen is apart of a mixed racial family. 2. After Jen’s father disappeared, her mother suffered from depression. I liked that the author included parts about depression, and that they were reali I started to really like this book within the first 10 pages! I liked how right off the bat, the reader is introduced to the main plot point where Jen’s father falls into a portal in her closet, and how the rest of the story builds from there. I also loved a few other things that I love seeing in books. 1. Jen is apart of a mixed racial family. 2. After Jen’s father disappeared, her mother suffered from depression. I liked that the author included parts about depression, and that they were realistic and written well. I think that these things are hard to wrote about, and I think many author might shy away from it for that reason. 3. The author also included parts about discrimination, as Jen’s boyfriends family doesn’t like their mixed race relationship. I thought that this was another realistic thing to put into the book, and how Jen’s boyfriend knew it was wrong. These things were all in the first 10 pages or so, and got me to love the book early on. I also really liked the Blue City itself. Blue City is from the year 2222, so way in the future. I thought that the city was really cool and I loved seeing it through Jen’s eyes and how everything was very futuristic. And I liked the fact that the portal was in Jen’s closet, and that it lead to the Blue City. I thought that the whole book was very interesting, and this is one of the books that makes me wonder how the author could have thought of the book. I also really liked the whole plot and story because it kept me interested the entire time and I couldn’t put the book down! In addition, I liked the romance in this book as well. I really liked Jen and Asher, and I also liked the relationships between Jen and her parents. You can tell from the beginning that Jen cares a lot for her parents, especially her dad because she grew up not knowing what happened to him from age 7 to 17. I can’t wait to see what happens with all the different characters and the relationships in the next book. Also Jen’s team in the Blue City is really cool as well. I liked all the characters in this book, and liked that they could all be real people, and were very original people. As a child, Jen Kallis loses her father to a mysterious hole in her closet. Years later, as a teenager, Jen finds herself entering that very same portal into a futuristic dystopia where she takes in the Blue City and it’s enormous buildings and hoverbugs that soar through the sky. In this city, Jen meets Asher, a soldier who defies his orders in order to help her on her years long search to find her father. This book was great from the very beginning. I appreciated that Charlay sucked her readers in from the get-go instead of holding back. It forced readers to dive into the craziness right along with Jen and very successfully held their attention. I loved that our heroine wasn’t cookie-cutter. She’s biracial, for starters, which is so rare in YA lit and something that we need so much more of. She’s also a spitfire and very firm with her morals and values. She’s Christian, which was an interesting addition to her personality because while it didn’t feel like she was pushing her beliefs down any throats, she wasn’t hiding it either — and ~generally speaking~ I haven't read many books where main characters bother giving us that kind of information about themselves. Blue City was amazing! I love the idea of sleek futuristic cities and Marie’s imagery was beautiful. From the chemically altered water to the sky-high buildings and hoverbugs, I was entranced. She didn’t leave out a single detail and while I was reading, I felt like I was actually there. I enjoyed the side characters of this book, as well. I thought Asher was pretty cool, and I would love to read more about his past. Lark was a sweetie and a stereotypical nerd and third wheel, so obviously I adored him. One thing I try to consistently avoid is insta-love, so I was a little disappointed that the romance in this book happened so quickly. Over a period of a few days, Jen has fallen in love and the declarations were a little over-the-top (but honestly, I’m so relieved that she got rid of the idiot boyfriend from the beginning that I can probably mostly forgive this). I had no trouble getting into the story of Blue City. The action kicks off right away, and there is a lot to visualize as Jen gets swept away into a crazy futuristic adventure. Things flow pretty smoothly as far as the story goes, but the omniscient point of view threw me off as it dodged around through the minds of different characters without a whole lot of rhyme or reason. 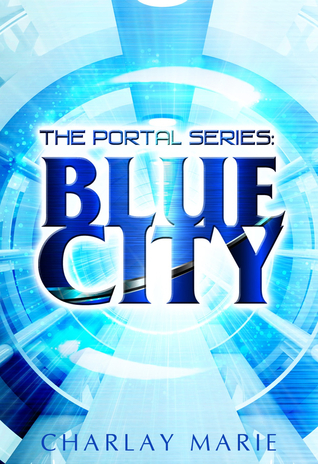 I am really curious to see where the story will go next, and I think if the POV gets ironed out in the next book I will b I had no trouble getting into the story of Blue City. The action kicks off right away, and there is a lot to visualize as Jen gets swept away into a crazy futuristic adventure. Things flow pretty smoothly as far as the story goes, but the omniscient point of view threw me off as it dodged around through the minds of different characters without a whole lot of rhyme or reason. I am really curious to see where the story will go next, and I think if the POV gets ironed out in the next book I will be able to give it a better review. Either way, the author got me hooked on the idea of this futuristic world, and I felt like she created a believable image for it.